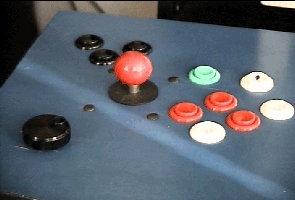 Growing up in the arcade generation, and with the creation of MAME, I desired very much to have the perfect arcade controller designed exactly the way I wanted it. When I first started my search I noticed that Tim Eckel of the ArcadeAtHome site had designed a great controller. And Tim was willing to build one for me (and only one) - a prototype so that he would also get a chance to document all the building steps for his site. But alas he got too busy, so instead he pointed me to Arcade Solutions. At Arcade Solutions I spoke with Andy Desak, and explained my situation. 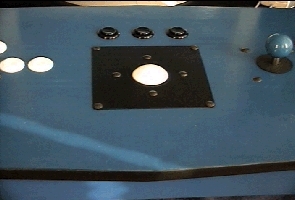 Not only did I want to completely specify the entire layout, but I also wanted to add both a trackball and a spinner, a combination that at the time and to my knowledge had not been done before (and probably still to this day is only available for sale at Arcade Solutions). Andy didn't hesitate from venturing into new territory. He scouted out additional high quality parts for the spinner and found a unique and clever way to hook the spinner and and trackball together so that they both worked off the same (serial) connection to the computer. All I have to do is throw an easy switch in the back and I can select on the fly whether to use the spinner or the trackball. Since no games that I know of require both, this solution is very efficient. 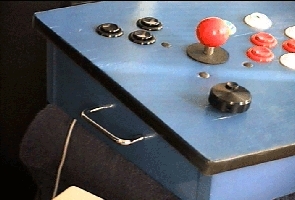 Additionally Andy made sure that his custom designed spinner would handle and last like a real arcade unit. Its made from very solid parts, and from one spin it keeps on spinning many times. The unit performs very well. Its programmable and I can also even use both my normal mouse and keyboard at the same time with the unit (without any switchboxes). I also have to say that after looking inside the unit by opening the access panel on the bottom of the unit, I am just as impressed from the workmanship on the inside as the great appearance of the unit on the outside - its build like a truck and wired very neatly. There's also an attractive handle on the side of the unit which allows you to carry the unit with one hand. I found Andy to be very good to work with. He was patient and was willing to talk in length to whatever degree that was necessary to understand all the details I gave him. He even sent me some verification pics of my specified layout during the design phase to help insure that everything was accurate. Overall I am extremely pleased. This unit should last a lifetime, and its just what I wanted.